As he got closer, she squinted and raised her hand up to shade her eyes from the bright sun, trying to see if it was him. It had been a cold dank morning with a smokey gray snow sky. She remembered shivering as she waited outside of the rehab for Gina to pick her up to bring her to the half-way house. Tom was the one who had greeted them at the front door. Fran had barely noticed him, though. She had been too nervous and afraid. She didn't want to be there. She didn't want Gina to leave. Tom was now on the wooden deck at the top of the dunes, only a few yards from her. Fran clutched her hands together, her bare fingers peeked out of the faded red fingerless gloves. The gloves were a gift from Gina. "They're beautiful," exclaimed Fran when Gina gave them to her. It made Fran begin to have hope that this time she might also be able to stick with the program. 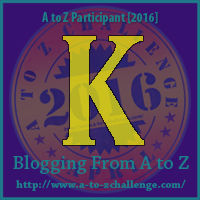 K is for Knitting, why of course! Good thing to do too while in rehab and the halfway house. I would imagine it would be good to keep the hands occupied like that. I find it is a good thing to do anywhere. It really can be a lifesaver. K day always seems to sneak up on me. And I never write about knitting. Strange, eh? Glad we got more of the story. Sounds like a part 3 is coming? My grandmum loves to knit. Great piece. I'd like to learn knitting some day. It looks relaxing. 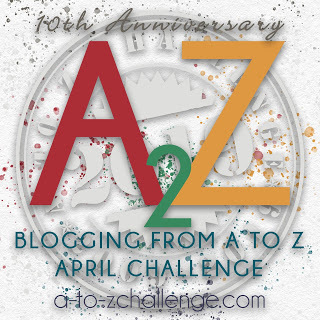 This is my MOST favorite piece I've read on the A-Z challenge. SO much story in so few words. Masterful. Thank you for sharing it.